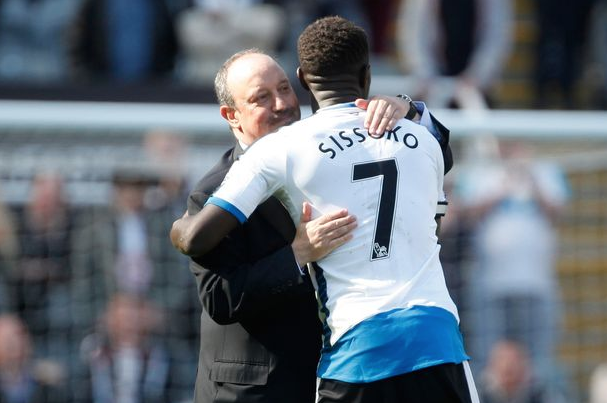 Moussa Sissoko reveals his big Rafa Benitez regret as he makes honest NUFC admission.. – NUFC blog – Newcastle United blog – NUFC Fixtures, News and Forum. Moussa Sissoko claims he was ‘very sad’ when Newcastle were relegated back in 2016 – stating that he still wishes Rafa Benitez arrived earlier that year, believing we would have stayed up if he was given more time. Sissoko left Tyneside in the summer of 2016 to little fanfare – most Toon fans were amazed Tottenham Hotspur were prepared to pay the reported £30m fee. The Frenchman has drastically improved in the Spurs engine room this season but still often flatters to deceive. “My first relegation. I was very sad. Newcastle are a huge club with massive fans and the potential is big. On the pitch, we did not do enough. We did not show our quality. “I believed Newcastle would come straight back up but I went to Tottenham to fight for titles. Benitez is universally respected in the football world – our relegation was mainly due to the failings of previous boss, Steve McClaren. It is credit to Rafa when you reflect on where we could be if he hadn’t stayed – most teams don’t bounce back, let alone stay there. Benitez actually made Sissoko captain during their time together, so there is a clear respect there. However, Sissoko may have had the same gratitude from Newcastle fans if he wasn’t constantly angling for a move away to the clubs of his ‘dreams’ whilst playing for us – or his inconsistent lackluster displays when we needed him most.